Full analysis of property crime rates and insurance costs in your city. The average American homeowner pays $1,173 per year for home insurance, but in New York, the average annual premium is $1,287. Even though insurance is more expensive for homes in New York, having insurance is vitally important because severe weather and accidents in the home can cause serious damage to properties in this state each year. What does my New York home insurance do for me? Your home insurance gives you a backup plan in case a catastrophe strikes in your neighborhood. Whether it's a fire, high winds or a burglary, you're covered if you have a suitable New York homeowners insurance policy. Example: A tree falls on your house, and rain ruins your 60" Samsung TV. Example: Your kid is playing baseball and accidentally smacks the ball through your neighbor's window. Example: You need a hotel while your house's roof is being repaired due to a fallen tree. Will I actually use my New York homeowners insurance? We can’t be 100% certain, but in 2016, insurance companies spent more than $2 billion on home insurance claims in New York. That's a lot of unfortunate events happening to New York homeowners. How is my New York homeowners insurance calculated? Insurance carriers calculate the cost of a home insurance policy by asking "how likely is it that something bad will happen?" The more likely it is that something bad will happen, the more expensive the home insurance policy will be, and vice versa. We call these potential disasters "risk." Let’s take a look at how risky New York is compared to the rest of the US. Even though the property crime rate in New York is much lower than the national average, homeowners should still be aware of the risk and take steps to protect their property. Winter weather in New York can cause a lot of difficulties for local homeowners. The freezing temperatures can lead to frozen pipes, water damage and even problems with collapsing roofs. The estimated cost to rebuild your home will play a large role in how much your home insurance costs. In New York, the average home value is much higher than the national average, which is one reason why costs in this state are relatively high when compared to other states. Are there any independent agents in New York? Yes! 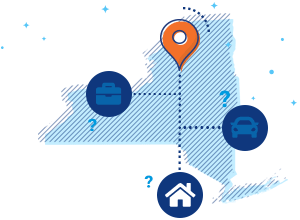 There are currently 1,287 independent insurance agents in New York who are ready to help. Did you know that independent insurance agents can give you multiple policy options to choose from? That way, you'll receive completely customized coverage that addresses all of your unique insurance needs. What’s the best insurance company in New York? Now, let's take a quick peek at what’s going on in your city. Insurance companies look at a lot of factors when determining home insurance costs. One of many factors is location. Crime rates, weather catastrophes and the overall cost of your home will also factor into how much your home insurance will cost. How does your city measure up to the national average? The average monthly cost of homeowners insurance in New York City is $97. Your actual rate for coverage will depend on a number of factors such as the structure and value of your property and your credit and claims history. Because rates can vary significantly from one homeowner to the next, and because there is a wide range of property values in the city, you can expect your costs to be considerably higher or lower than the average rate. Your New York City homeowners insurance can cover you against a wide variety of risks you may face as a property owner in the Big Apple. These can include weather-related damage, property crimes, and liability lawsuits. An independent agent can help you review the specific hazards you face and can help you be certain that the policy you purchase provides the coverage you need. Unlike buying insurance directly through an agent who works for a specific company, an independent agent has the freedom to quote multiple companies. Your agent will make sure you receive the best home insurance for your needs. The average monthly cost of homeowners insurance on Long Island is $197. Your actual home insurance cost could be significantly less or more, depending on various factors like the size and value of your house, your credit score, your house's construction materials, and the crime rate in your ZIP code. Given the wide range of property values on Long Island, the variance in rate can be significant. Long Island homeowners insurance is designed to protect policyholders from financial risks resulting from the various hazards they face as property owners. Severe storms, property crimes, liability lawsuits, and residential fires are just some of the many risks you can receive coverage against. One problem that is not covered, however, is flood damage. Fortunately, an independent insurance agent can help you supplement your homeowners insurance with a flood policy through the NFIP. Did you know that an independent agent has the freedom to provide quotes from multiple companies? Your local agent will make sure you receive the best home insurance to meet your coverage and budgetary needs. The average monthly cost of homeowners insurance in Buffalo is $53. Because home insurance costs are personalized, your actual rate can vary significantly from this amount. Insurance companies determine costs by considering a number of factors such as the age and value of your home, the crime rate in your ZIP code, and your credit and claims history. Because each insurer has a distinct method for calculating rates, it pays to shop around and compare quotes from multiple carriers. Buffalo homeowners insurance covers against a variety of risks including liability lawsuits, property crimes, and severe weather. Winters in New York can be terrible to deal with. Mother Nature brings not only heavy snowfall that can damage roofs under their weight, but also extremely cold temperatures that can affect your home's plumbing system. Don't let a damaged roof or frozen pipe ruin your year; get insurance with the proper coverage. You'll receive the best home insurance for your needs when you partner up with a Trusted Choice agent. It's much different from buying coverage directly from a carrier or through an agent who works for a specific company. Experience it for yourself by contacting your local agent to start comparing policies. The average monthly cost of homeowners insurance in Syracuse is $51. The size of your house, your credit score, the crime rate in your ZIP code, and your home's building materials are just some of the many factors that play a role in how much you can expect to pay. You should therefore not be surprised if your quoted rate varies significantly from the average for the city. Your Syracuse homeowners insurance is designed to provide protection from losses related to a number of hazards you face as a property owner in this city. These include such things as property crime, severe weather, liability lawsuits, and accidental fires. Any of these risks can bring about large financial losses. Don't get left footing the bill; get 360 degrees of protection. When you buy your Syracuse home coverage through a local independent insurance agent, you'll receive multiple quotes to choose from. Not all policies are created equal. Your indpendent agent will make sure you receive the best home insurance to meet your particular needs. It's a great relationship you can't afford to bypass. The average monthly cost of homeowners insurance in Hempstead is $115. Take this average with a grain of salt, however. Insurance rates can vary significantly from one homeowner to the next, particularly in a city that includes homes with a wide range of property values. Your actual home insurance rate depends on a number of distinct factors such your home's size, value, and building materials as well as your claims history and credit score. Hempstead home insurance can cover against a wide variety of hazards. These include liability lawsuits, residential fires, burglaries, and severe weather. Storms that bring high winds are an example of a threat to area homes, since they can sometimes cause trees to fall, roofs to lose shingles, and flying debris to break windows. A home insurance policy can help pay for these damages. Buying insurance directly from an agent who works for a specific company might not get you a comprehensive, customized and affordable insurance plan like the one you would find with an independent agent. The average monthly cost of homeowners insurance in Yonkers is $102. Given the wide range of property values in this community, it should come as no surprise if your quoted rate is significantly higher or lower than this number. Rates are most influenced by the amount of coverage you are purchasing and the crime rate in your ZIP code. Other factors can include the size and age of your home, your claims history, and your credit score. Yonkers is a safe community, but homeowners in the area still have a number of risks to protect themselves against. Make sure that your homeowners policy properly covers you against the hazards specific to your family and your home including such things as severe weather damage, liability lawsuits, burglaries, and residential fires. Whether caused by an accident in your home or outside forces, fires can lead to devastating damage. Though the loss can be stressful, you can rest assured knowing that you are financially protected by a solid Yonkers homeowners policy. You can get help finding the best home insurance to meet your coverage and budgetary needs by working with a local independent insurance agent. These agents can help you compare policies and rates from multiple carriers so that you can be sure that you are getting reliable coverage at a competitive rate. The average monthly cost of homeowners insurance in Brooklyn is $94. Bear in mind, however that your actual home insurance rate will depend on a variety of factors like the size of your house, your credit score, and the materials used in the construction of your house. That means your monthly payment can vary greatly from this average, since it's unique to you. Brooklyn homeowners insurance can offer protection against financial losses related to a variety of covered events. These often include property crimes, liability lawsuits, residential fires, and severe weather events, excluding floods. For coverage against flood damage, you will need to supplement your insurance with a flood policy through the NFIP. A local independent insurance agent can show you how. We know you like options. That's why we encourage you to contact an independent insurance agent. These agents can work with multiple insurance companies to find you a customized policy that fits your coverage and budgetary needs. Find an agent near you to get started. The average monthly cost of homeowners insurance in Queens is $99. Your home insurance could cost quite a bit less or more than this average, but it's a good baseline to follow. When calculating rates to provide you with a quote, insurance companies will take various factors into account. These can include information about the type of home you are insuring, its value and square footage, and the crime rate in the ZIP code in which it is located. The coverage offered by Queens homeowners insurance encompasses a wide range of damaging events and accidents. If your property is physically damaged by a severe weather event, residential fire, or property crime, you can turn to your home insurance company for assistance with paying for the resultant damage. Talk to an independent agent to learn more about what is and is not covered by this important insurance. Unlike an insurance carrier or an agent who works for a specific company, an independent agent has the freedom to provide quotes from multiple companies. Your local agent can help you review your options and ensure that you receive the best and most reasonably-priced home insurance to meet your specific needs. The average monthly cost of homeowners insurance on Staten Island is $85. Of course, property values vary greatly throughout this New York community, and so too do insurance rates. You should therefore not be surprised if your quoted rate is significantly higher or lower than this average. Some factors that insurance companies use when determining rates include the size and value of your home, the number of people who live in it, and even your credit score. The purpose of Staten Island homeowners insurance is to protect property owners from financial risks associated with a variety of expensive hazards. These include property crimes, severe weather events, and liability lawsuits. If your home sustains significant damage, it doesn’t have to break the bank. You can file a claim with your insurance company for assistance with repairing or replacing that which has been lost or damaged. An independent agent can help you assess your risks and obtain the right coverage to ensure that you are fully protected. When you buy homeowners coverage through a local independent insurance agent, you can expect to receive help finding customized, comprehensive and affordable insurance. Our agents have the freedom and flexibility to obtain quotes from multiple insurers so you can be certain that you are getting great coverage and a competitive rate. The average monthly cost of homeowners insurance in the Bronx is $85. Property values in the Bronx tend to be rather high, and this often means that homeowners are seeking a high amount of coverage. This has a tendency to put rates on the higher end of the spectrum. However, the needs of each homeowner can vary significantly throughout this community; so, depending on your particular case, you can expect your rates to be significantly higher or lower than this average. You face numerous risks as a Bronx homeowner. And most of them can result in some form of physical property damage. But broken windows, broken doors and damaged roofs are no problem when you have the best home insurance. Unlike buying insurance through an agent who works for a specific company, when you shop for coverage through an independent agent, this person has the freedom to provide you with policies and quotes from multiple companies. These agents can help you be certain that you are receiving the best home insurance to meet your coverage and budgetary needs.